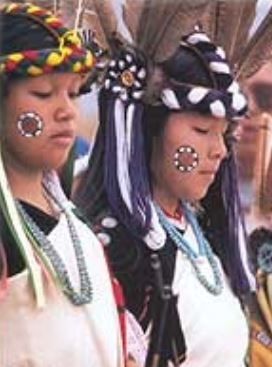 For more information on visiting and learning about the Hopi people, see Experience Hopi. The Hopi, Hopitu-Shinumu which means "peaceful all people" are a Native American people predominantly located in northeast Arizona on the Hopi Reservation. The Hopi Reservation is inside the Dine (Navaho) reservation as Navaho people moved into this region about three to five hundred years earlier and surrounded the Hopi nation. There are three mesas on the Hopi Reservation, home to 12 villages (11 are Hopi villages and 1 is a Tewa village). The First Mesa consolidates the villages of (1) Walpi, (2) Sichomovi and (3) Tewa. The Second Mesa includes the three villages of (4) Shungopavi, (5) Mishongovi and (6) Sipaulovi. The Third Mesa is home to the villages of (7) Kykotsmovi, (8) Old Oraibi, (9) Hotevilla and (10) Bacavi. Forty-five miles to the west near Tuba City, is the Hopi village of (11) Moenkopi. Historically, they celebrated Soyal, the winter solstice ceremony, held on December 21, the shortest day of the year. The ceremony signifies bringing the sun back from its long winter slumber. It also marks the beginning of another cycle of the Wheel of the Year, and is a time for purification. Pahos, or prayer sticks, are made prior to the Soyal ceremony, to bless all the community, including their homes, animals, and plants. The sacred underground ritual chambers, called kivas, are ritually opened to mark the beginning of a new season. Many Hopi still practice traditional beliefs, specifically practiced and governed the Second Mesa in four villages, each village having a spiritual leader, a Kikmongwi. Those villages include Shungopavi, Mishongnovi, Shipaulovi and First Mesa Consolidated Villages. These villages have the protection of following a Traditional Way of Life and governing. For more info, see Traditional Hopi. However, evangelical Christian presence exists in several villages. For instance, the First Mesa Consolidated Villages are home to the First Mesa Baptist Church. In the First Mesa Consolidated Villages, there is also The Church of Later Day Saints (Mormons) present, which is not considered evangelical Christian and would be classified as a Christian cult. In the Mesa Three, three villages have evangelical Christian presence. In the village of Kykotsmovi is the Hopi Mission School, an evangelical K-8 grade school plus Hopi Independent Church. Hotevilla-Bacavi is home to the Bacavi Community Fellowship. Evangelical Hopi are still very few and therefore even though the Hopi are considered no longer unreached, a great need exists for spreading the Gospel among the Hopi. Pray for evangelical Christians ministering among the Hopi that they may boldly share a contextualized and reproducible model among the Hopi. Pray that evangelical Hopi will grow strong in their faith, sharing their testimony in the midst of social ostracism. Pray that God will raise up Christian spiritual leaders among the Hopi who will train and empower other evangelical spiritual leaders.